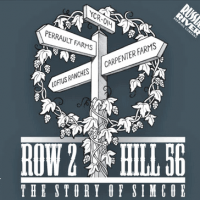 Row 2, Hill 56 was the inspiration for my latest attempt at a pale ale, or American pale ale to be exact. Before I go any further I should mention that my girlfriend played a huge role in this beer, coming up with the idea, helping make the recipe, and doing much of the brewing. So she probably should get most of the credit if it turns out well. As I mentioned above, the idea behind this beer was a clean, refreshing pale ale, single hopped with Simcoe, with a ton of hop flavour and a smooth, restrained bitterness. I figured the best way to achieve this was with a technique Gordon Strong dubbed all late hopping, but that many homebrewers refer to as hop bursting, a term I'm not too fond of. The gist of it is that no hops are used at the start of the boil where most of the bitterness in a beer is usually extracted. Instead a larger amount of hops are used much later in the boil, usually all in the final 20 minutes. This gives a large amount of hop flavour and aroma, while providing a smooth, clean bitterness with minimal harshness. It sounded like just the ticket to make this beer happen. Tasting Notes: Everything went well with the brewing and fermentation of this beer and it ended up between 5.5% and 6% abv as planned. The low amount of crystal in this recipe kept the body light and the beer drinkable. The bittering level was just right, being on the firm side of medium. The hop character of this beer was definitely its most interesting aspect being prominent despite the fairly low bittering rate. I was surprised how tropical in character the Simcoe was, in addition to the more predictable character of citrus and pine. To me it sometimes verged on being a bit catty, but everyone else who tried didn't find this, so maybe I was just being too hard on it. This has been a great experiement and Im looking forward to trying the same recipe out with Amarillo next time.